OIC countries should resolve all conflicts peacefully and solve all issues politically without giving any scope of interference and intervention to detractors : Bangladesh Prime Minister. Urging the Organization of Islamic Cooperation (OIC) to stand firm by the distressed Rohingyas, Bangladesh Prime Minister Sheikh Hasina today said the organisation must have to maintain international pressure on Naypyidaw to take back their nationals as it has agreed with Bangladesh for their safe return. Pointing out the message of Holy Prophet Muhammad (PBUH) to stand by the distressed humanity, she said “OIC fraternity cannot overlook it when the Rohingya community of Myanmar is being subjected to ethnic cleansing”. 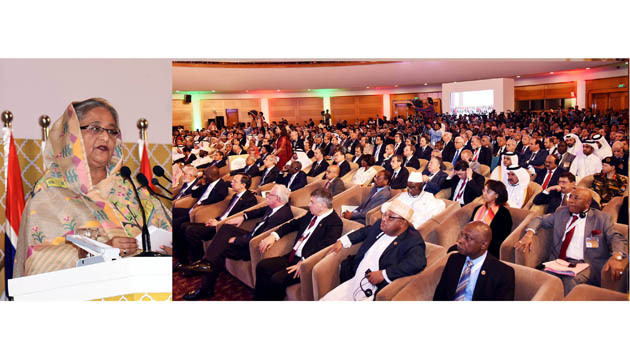 Sheikh Hasina was inaugurating the two-day 45th OIC Council of Foreign Ministers (CFM) at Bangabandhu International Conference Centre (BICC) here today. 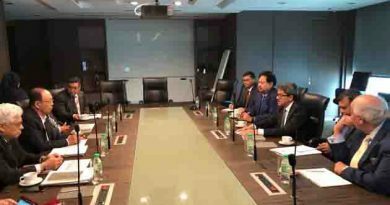 “OIC must maintain international pressure on Myanmar so that they take back their nationals as it agreed with Bangladesh for their safe return,” she said. “Rohingyas deserve the right to live with dignity like us,” she added. On the occasion, chair of the 44th CFM and Foreign Minister of C”te d’Ivoire Marcel Amon-Tanoh handed over the chairmanship of 45th CFM to Bangladesh Foreign Minister Abul Hassan Mahmood Ali. The prime minister said she personally felt the sufferings of the Rohingyas as she herself once suffered refugee like situation for six years after brutal killing of her Father in Bangladesh. “I was unable to return home after my father, the Father of the Nation Bangabandhu Sheikh MujiburRahman, along with 18 family members, was brutally assassinated,” she said. 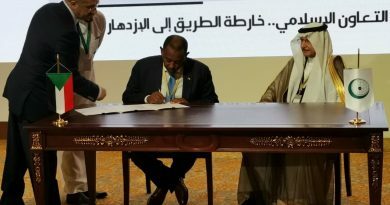 “My appeal, therefore, to the OIC, is to stand solid by the forcibly displaced Rohingyas in safeguarding their dignity and security,” she said. Sheikh Hasina said the Dhaka CFM has come up at a very critical time of history when Islamic beliefs have so fundamentally been challenged. “There is no time to stay idle when the Muslim world faces so much conflicts, internal strife, division, instability and forcibly displacement of people takes place in a large scale,” she said, lamenting that the Muslim identity, though wrongly, is being equated with that of extremism and violence. “These cannot go on. Time has come for a “paradigm shift” in our consciousness; for a fresh approach to start shaping our future of sustainable peace, solidarity and prosperity,” she said. “Our vision of the Islamic world should be one to be master of its own resources and capable of resolving all of our conflicts and problems by ourselves,” she said. “For, solutions to be lasting have to come from within. For this we require a comprehensively reformed OIC with new mechanisms, and ways and means to deliver in a result oriented manner,” she added. All differences of opinion and views that Islamic world have been experiencing can be resolved by open-minded discussions and dialogue…. bloodshed is unnecessary and indeed counter-productive, Sheikh Hasina said. Reiterating her steadfast stand against terrorism and four point proposals she made in Riyadh Conference in 2017, the premier said the points still remain valid to address terrorism. “We should stop supply of arms; stop flow of financing for terrorism; remove divisions within the Ummah, and pursue peaceful settlement of conflicts through dialogue resulting in a win-win situation,” she said. Sheikh Hasina said with one fifth of the world’s population, more than a third of the world’s strategic resources and a number of rising economies with immense prospects, the Muslim world has no reason to remain behind or fall in disrespect. In this context, she gave five suggestions so that Islamic countries unitedly can protect their values, wealth and civilization. Firstly, she said, Islamic countries must keep trust in basic Islamic faith, banish sectarian mindset and stop using religion as a tool for divisive purposes or narrow political ends. Secondly, OIC countries should resolve all conflicts peacefully and solve all issues politically without giving any scope of interference and intervention to detractors. Thirdly, OIC countries should live an enlightened life of self-awareness in appropriate with modern society without compromising their fundamental faith to stamp out Islamophobia. “We should foster value based international relations to show the way to an enlightened global order,” she added. 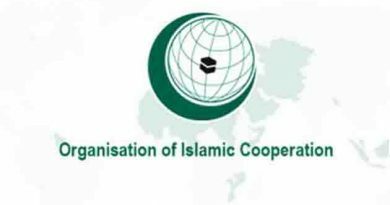 Fourthly, she said, OIC countries should pursue a fast track development course to eliminate poverty and hunger and address humanitarian exigencies and collective actions to implement the OIC-2025 Programme of Action. “Finally, we should constantly seek inspiration and strength from the eternal values of Islam – peace, moderation, fraternity, equality, justice and compassion,” the premier said. Sheikh Hasina said Bangabandhu had early realized the necessity of collective voice of the Ummah on issues of global importance, as to why Bangladesh, under his visionary leadership, joined OIC in 1974. “Bangabandhu gave importance on unity and solidarity within the Ummah in its common aspirations of peace, prosperity, development and security. His vision still inspires us to move ahead as a nation,” she said. In her speech, the prime minister also highlighted Bangladesh’s economic progress and accession to the status of a developing country from LDC despite frontline battle against climate change and other constraints. ← Kilauea volcano eruption near a residential area on Hawaii’s largest island, emergency has been declared. 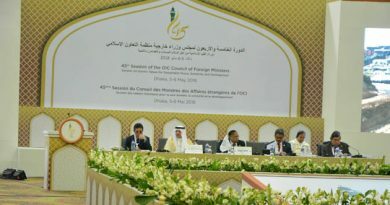 The 45th session of the Council of Foreign ministers of the OIC has concluded today.